Burns Night is not, as the name might suggest, the consequence of a particularly explosive celebration involving fireworks, but a famous Scottish tradition honouring the country's national poet, Robert Burns. Burns Night is annually celebrated in Scotland and other countries on or around January 25. It commemorates the life, work and spirit of the bard (poet) Robert Burns, who was born on January 25, 1759. The day celebrates his contribution to Scottish culture. Burns' most famous poem (and song) is 'Auld Lang Syne'. This poem written by Burns in 1788 and set to the tune of a traditional folk song, is well known in many countries, especially in the English-speaking world, its traditional use being to celebrate the start of the New Year by singing the song at the stroke of midnight. By extension, it is also sung at funerals, graduations and as a farewell or ending to other occasions. The song's Scots title may be translated into English literally as 'old long since' or 'long long ago' or 'days gone by'. Robert Burns, also known as Scotland's favourite son, was born in Alloway near Ayr in Scotland on 25 January 1759 and died on 21 July 1796. Robert was the eldest of seven children. Although his father was a gardener and then became a tenant farmer, his parents ensured their son had a good education and he soon became an avid reader. Robert spent his youth working on his father's farm, but in spite of his poverty he was extremely well-read - at the insistence of his father, who employed a tutor for him and his younger brother Gilbert. At 15 Robert was the principal worker on the farm and this prompted him to start writing in an attempt to find 'some kind of counterpoise for his circumstances'. It was at this tender age that Burns penned his first verse, 'Handsome Nell', which was an ode to the other subjects that dominated his life, namely Scotch and women. When his father died in 1784, Robert and his brother became partners in the farm. However, Robert was more interested in the romantic nature of poetry than the arduous craft of ploughing and, having had some misadventures with the ladies (resulting in several illegitimate children, including twins to the woman who would become his wife, Jean Armour), he planned to escape to the safer, sunnier climes of the West Indies. However, at the point of abandoning farming, his first collection 'Poems - Chiefly in the Scottish Dialect - Kilmarnock Edition', was published and received much critical acclaim. This, together with pride of parenthood, made him stay in Scotland. A journey to the West Indies wouldn't have been a safe option either, because there was a lot a disease and Burns would have had a dangerous voyage to get to the estate where he would have been working. So he moved around the country, eventually arriving in Edinburgh, where he mingled in the illustrious circles of the artists and writers. Robert Burns is the most famous poet who has ever written in Scots and is regarded as a pioneer of the Romantic movement. During his lifetime there were three main languages in daily use. The Scots language, the English of the time and the Gaelic language which was retreating north and westwards. Gaelic persisted in many remote areas but gradually faded with the remaining stronghold being in the Western Islands. The Scots language derived from an inherited mix from Picts, Vikings, Irish and Welsh and the Scots was further distilled in to dialects notably Doric in the North East and Lallans in the southern part of Scotland. Robert Burns used words from all three and his legacy of writing and compositions are in some cases in 'pure' Scots, but also in English which does not require a glossary of explanations. Burns was a prolific writer throughout his short life, producing a phenomenal number of poems, songs and letters before dying at the age of 37. Writers such as Alexander Pope and Laurence Sterne provided inspiration, but his relationships with women had perhaps an even stronger influence on his own work. Many of his illicit relationships resulted in some of his most famous poems, such as 'Ae Fond Kiss' and 'My luve is like a red, red rose'. 'To a Mouse, on Turning Her Up in Her Nest with the Plough' , is a Scots poem written by Burns in 1785. According to legend, Burns wrote the poem after finding a nest full of mice during the winter. And forward, though I cannot see. 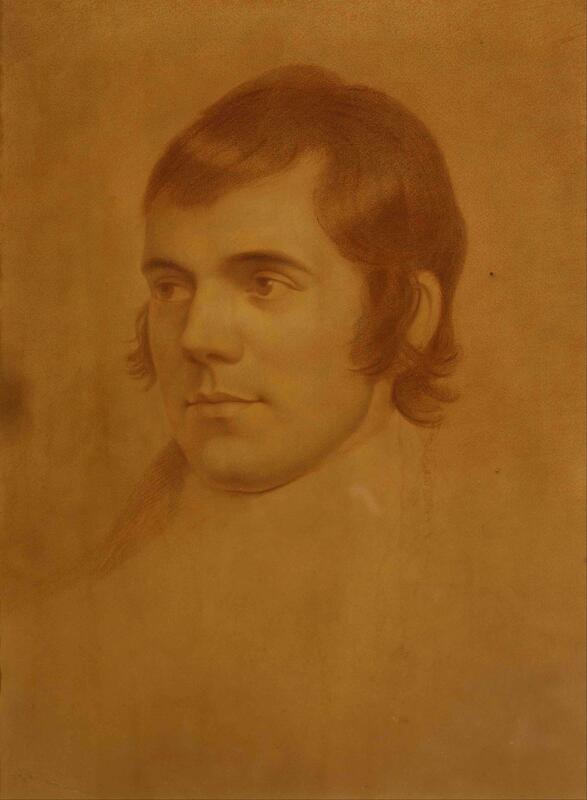 Robert Burns became famous for his poems about country life, many of them written in Scots dialect, on topics familiar to his audience, including 'To a mouse', and 'To a louse'. The late 18th century was one in which enthusiasm for romanticism and pastoral pleasure blossomed and Burns was hailed as the 'Ploughman Poet' when he was only 27. The first Burns Club ('The Mother Club') was founded in Greenock, a town in the west of Scotland, a few years after his death in 1796 'to cherish the name of Robert Burns; to foster a love of his writings and generally to encourage an interest in the Scottish language and literature'. There is a friendly rivalry between the Burns Club of Greenock and Paisley as to which was the first - each claiming that position, but proof is difficult as they have counter claims.